Purpose: In recent years, a large number of studies have investigated obsessive–compulsive disorder (OCD) using diffusion-weighted images (DWIs) and have reported microstructural abnormalities in various regions, mainly the corpus callosum and cingulum. In the present study, we aimed to detect microstructural changes in the white matter using whole-brain tractography. Patients and methods: We obtained MRI data from 25 adult non-medicated OCD patients and 27 healthy controls. 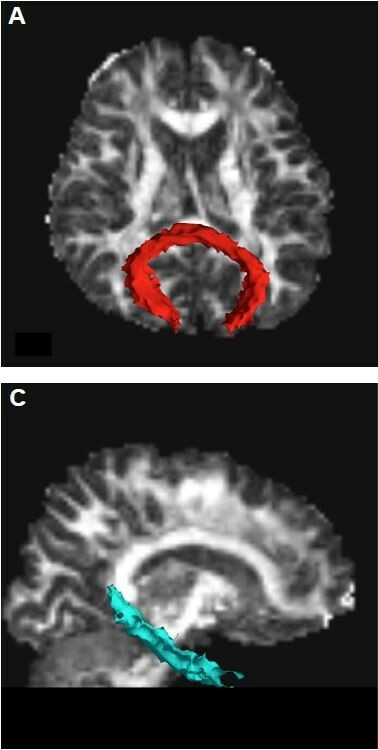 DWI data from MRI scans were analyzed by the automated probabilistic tractography method referred to as TRActs Constrained by UnderLying Anatomy (TRACULA). We investigated diffusivity parameters: fractional anisotropy, radial diffusivity (RD), axial diffusivity, and mean diffusivity in 18 major white matter tracts and examined indices to know which measurements in which fibers can predict the diagnosis of OCD. Results: Compared to healthy controls, OCD patients had significantly increased RD in the forceps major and a reduction of RD in the right cingulum angular (infracallosal) bundle. There was no correlation between these values and the clinical features. Conclusion: We found RD alterations in the forceps major and the right cingulum angular (infracallosal) bundle, which might be associated with myelination changes in the temporal and occipital regions in OCD. Our results suggest that the pathogenesis of OCD may include abonormality of myelination status in not only the fronto-striato-thalamic circuit but also the posterior and temporal regions.